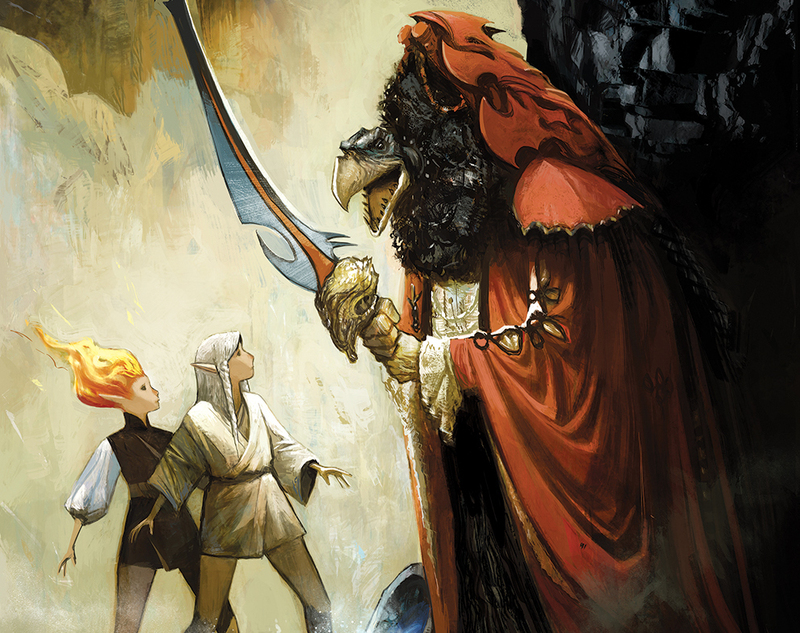 The Power of the Dark Crystal #8 Review – AiPT! Two words: “their essence.” The Skeksis have been freed from their cell and are rampaging the castle. First stop, the Crystal of course, and its bountiful treasure. Ah and what do we have here? An extra bonus? A podling. Now these are the Skeksis that I remember. Hunting Podlings to drain them of their essence and restore youth to the Skeksis. Readers will lament as they strap the frightened Podling into the essence draining chair. 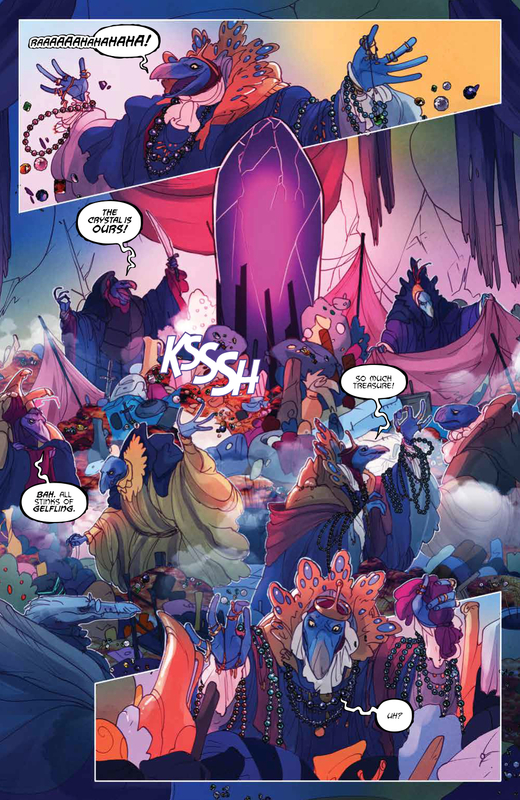 As the threat of the Skeksis draws nearer, the palace guards are once again inept and it is Aughra that must save the day. Kira and Aughra quickly retreat to the upper tower with the aid of some magically retracting vines. It is not clear if these were always there or if Aughra just conjured them for the purpose of escaping. The panel layout in this issue is mindful. Layering individual scenes on top of a full page image adds depth and movement. The escape scene is a great example of this technique. 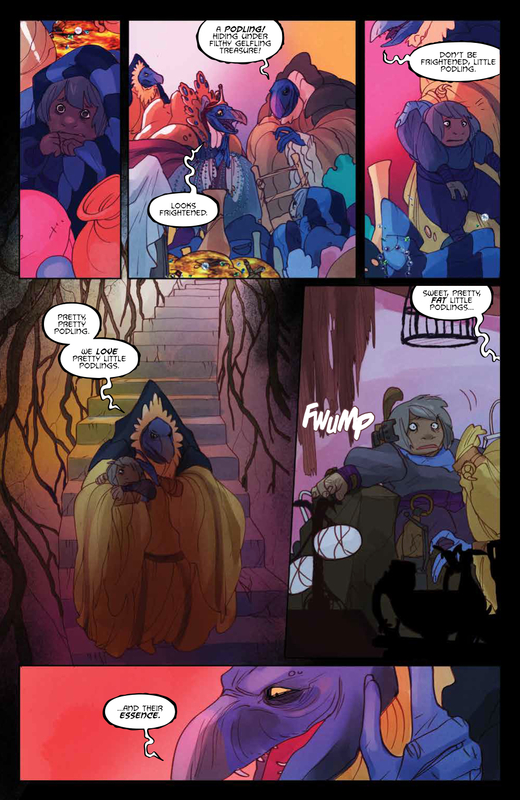 The moment when the vines lift Aughra and Kira to safety are overlaid an outside view of the castle and the guards dropping the support to barricade the entrance. Meanwhile, near the entrance of the inner Fireling world, Jen reads some Gelfling text and finally has a revelation. He sees Kensho and Thurma as a reflection of what he and Kira once were. I have been a bit annoyed that it has taken Jen this long to see that Thurma and Kensho have good intentions. Throughout this series Jen has been written as someone with mild reservations about the two young criminals. I think this part of the story has been dragged out a bit too long to remain true to the character. Perhaps it is because Jen has been sleeping so long that he has completely forgotten about the power and the light of the crystal. That he and Kira had wanted a world of peace and kindness, but I feel that he should have come to this conclusion a bit earlier. Can the two worlds coexist with a broken crystal? Before that can be answered, enter Chamberlain to thwart Thurma’s return home and take control of the Garthim. Why is it that five palace guards cannot take down one Skeksis? It seems a bit too easy for Chamberlain to begin flooding the fiery world and overtake the guards. Chamberlain is driven but I still think it’s a bit of a stretch that the guard cannot capture him. My one delight will be if Chamberlain returns to the castle and rubs his newfound power in the other Skeksis’ beak-like faces. You love to hate him but also feel sorry for him. This guy needs a moment. Thurma is so close to saving her home. She has lied to Kensho so he will keep helping her and now the two are faced with the truth. She confesses that the pool of tears is a children’s story. Or is it? Kensho and Thurma begin to cry as they realize the ways in which they have hurt one another. Readers are left to wonder, will their combined tears be what saves Thra? Did I like it? This issue had a few shortcomings for me but all in all the heart of the story rings true. The crystal is meant to produce peace and unity and heal the world. Now it remains to be seen if Thra can be knit back together with a broken crystal. Five guards can’t take down one Skeksis?